: A little trip to the Korean store introduced me to Assi Brand Chrysanthemum Tea. This instant tea is shocking to say the least. First off, it’s instant tea, something I am very unfamiliar with. Second, the loose tea is in the form of tiny nuggets that look like Grape Nuts, making it not even tea. Thirdly, this “glucose-enhanced” herbal tea wannabe is SWEET, and not the Cartman sweet. After emptying the rather hefty packet of tea kibbles into my cup, I was enthralled by the disciplined, oriental smell. The taste that followed was an intense honey overload. Tea with honey is good, but this is sweet tea on crack. I did the “drink half then add more water” trick three times and this bad boy was still sweet as fudge. I would recommend using between ¼ to ½ of a packet for best results. 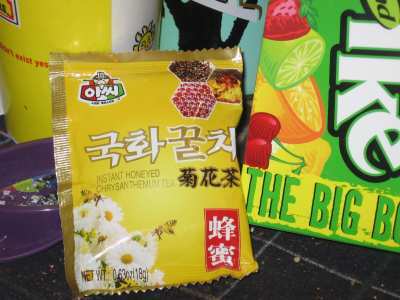 If you like extra sweet tea, this honey chrysanthemum tea from Assi brand is for you. Otherwise, keep it moving. Assi Brand Chrysanthemum Tea (Honeyed) is a speciality (spelled as is on box) of oriental, which is scientifically processed from premium choices of Chrysanthemum and Honey that is enriched with glucose and vitamins. With its own unique flavor, the delicious and nutritious (spelled as is on box) tea is ideal for home and travel. If you enjoy honey, and I do, you will enjoy this tea. Simple as that, it tastes much like hot honey water with a few herbs. You can also taste the “glucose enhancement” in this honey tea because it’s damn sweet.